Nutrition starts at the source. This has been our philosophy ever since we opened our doors in 1977, and wellness has always been our passion. We are a company of wellness enthusiasts. We’re passionate not just about nutrition, but also about helping others discover their best self. 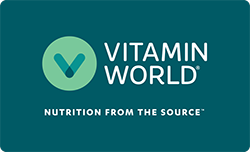 Vitamin World is based in the U.S., but we source the most unique ingredients from all over the world, which is a process we’re very picky about. Once we’re satisfied with the source of the ingredients, we ensure that they are meticulously cultivated. Then, these treasures are brought to world class manufacturing facilities, to create and produce our premium supplements. This is how we’re able to guarantee that every product is rigorously tested, and meets our sky-high expectations. From there, the products are packaged and distributed right to you. So when we say “nutrition from the source,” you can rest assured that we really, really mean it. At Vitamin World, there’s a world of possibility. Let us help you to get to know the wellness enthusiast inside you.